Working mom and wife just trying to keep my head above water. I know I am far from perfect, just striving for A for Effort and hoping to make you laugh along the way. I am NOT a beauty expert. I will say it again… I am NOT a beauty expert. But I have spent the last few months trying to figure out my perfect skincare routine – so if you also want nice skin on a relatively small budget this post is for you! I turned 32 this year. I also decided that I needed to take better care of my skin. I set out with a goal of “fixing” my skin so that I could just wear mascara and a little powder to work. I am 5 months into that goal and I think I am pretty happy with my routine. Also, my skin is looking pretty clear! Starting out, I was never one to have bad acne. I get a few zits here and there when I get my period, but nothing too crazy. After my son was born I was diagnosed with Hashimoto’s, a thyroid condition causing hypothyroidism. Then last year I got lymes disease. Between the 2 of those and the new medication I was on to combat them, my skin went haywire! For the first time in my life, I was getting that deep cystic acne that you just have to wait out. Flash forward to January 2018 and my skin had cleared up, but I now had a TON of annoying red acne scars. This is when I decided that I would stop layering on more and more makeup, and instead, fix my skin. I also wanted to not spend Blakes entire college fund on skincare. So most of the products I use are drugstore brand, and then I have 1 splurge item in the morning and 2 at night. I wash my face in the morning. I tend to have combination skin, so my skin is fairly dry, but my t zone is more oily. So when I wash my face in the morning I only put soap on my oily areas, the other areas I just rinse with water. 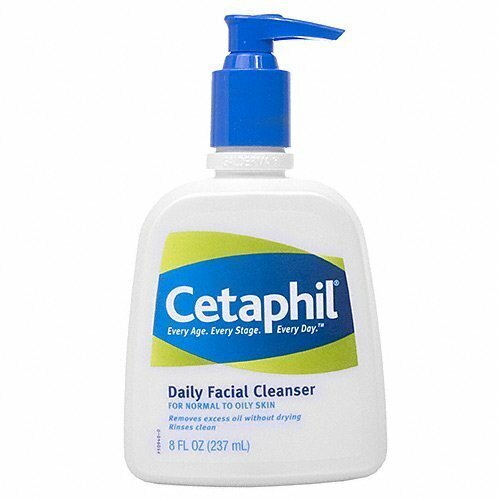 I use Cetaphil Daily Facial Cleanser, Normal to Oily Skin. I then put on toner. 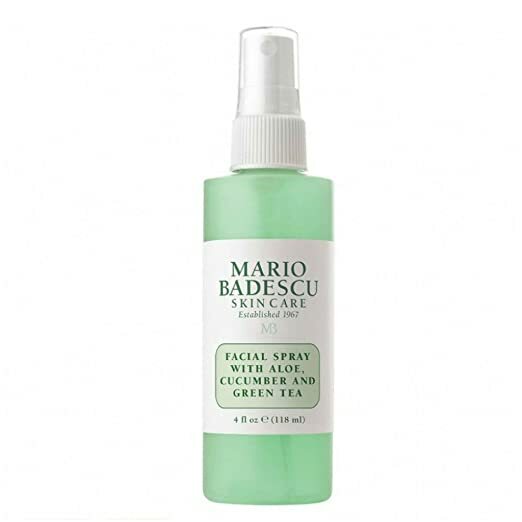 I really like the Mario Badescu Skin Care Facial Spray with Aloe, Cucumber, and Green Tea. It comes with a spray top so I can just spritz it on. I have heard great things about some of their other toners too but I love the fact that this one has Aloe in it. 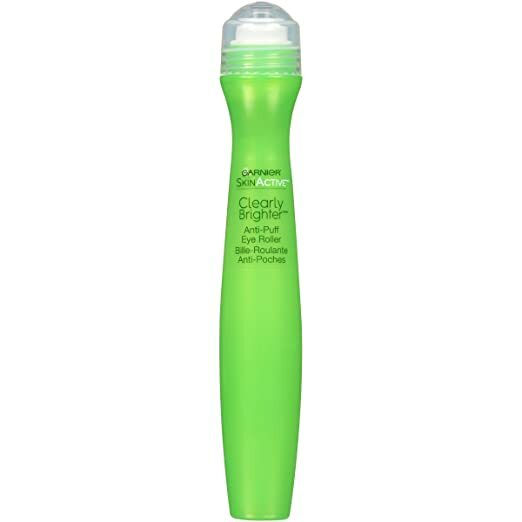 I follow that up with Garnier SkinActive Clearly Brighter Anti-Puff Eye Roller. It has a cooling effect so it wakes me up, makes me feel refreshed and helps to tame the bags under my eyes. Next, here comes my morning splurge item. I LOVE the OLEHENRIKSEN Truth Serum. It is light and I feel like it has really helped to even out my skin tone. It is also very hydrating but not greasy. I usually let that sink in for a few minutes while waking Blake up (he wakes up SLOW like his mama, needs his relaxing time in the morning). I finish with a moisturizer, I like CeraVe AM Facial Moisturizing Lotion with Sunscreen. I feel like 30 SPF is a good level for day to day. I also like that it soaks in and isn’t too greasy under my make up. And there you have it, folks. I follow up my makeup and I am out the door. I didn’t want this post to get too long so I broke it up into 2 parts. Part 2 I will go over my PM routine which is a little longer.